If you buy fresh shrimp or even frozen shrimp with the shells on, you'll find our description and photos showing how to clean shrimp useful. Most shrimp in the United States are sold with the heads removed, but the shells may still be on - which is good, because it helps them retain flavor and texture. With our easy directions for how to clean shrimp, you can quickly prepare your shrimp for cooking. You can remove the shells easily before or after cooking, but the vein is much easier to remove from uncooked shrimp. Do you really need to devein the shrimp? You don't have to . . . but you may want to devein larger shrimp. The "vein" is the dark line that you can see running down the shrimp's back. It's actually the shrimp's digestive tract. Depending on what the shrimp's been eating, it can be a little gritty. Most people don't bother deveining small to medium sized shrimp, because it's not apparent. 1. Remove the shell. We use either a small paring knife or a shrimp peeler/deveiner like the one in the photo. Insert it inside the shell along the shrimp's back and pull up gently. This loosens the shell, and you can easily pull it off. 2. Remove the vein. Do you see a dark line along the top of the shrimp? If so, use a small paring knife to make a shallow cut along the line. Use the tip of the knife or peeling/deveining tool to lift up, pull out, and remove the vein. What if you don't see the dark line? No problem - no need to devein! 3. 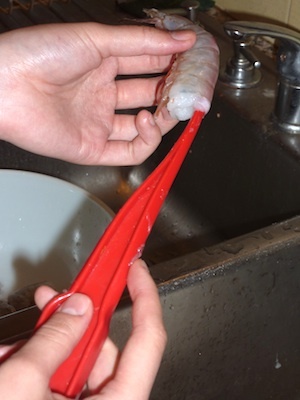 Rinse the shrimp quickly under running water. That's it! Your shrimp are now shelled, deveined, and ready to cook.